Green - Chateluy in St Gervais. It's where I learned to ski with lots of family. Fresh snow every night and Bluebird everyday. Blue - Either plan Bois or Barmont on the way back to the vanois express in Les Arcs. Lots of little runs into the woods off of the side. Red - Honestly can't think of one..... How bizarre. Black - +1 for Flypaper at Glencoe. The scariest Black I've done, especially as there was no one around, no tracks to follow in fresh snow, it was my first time down it and the light was poor... Rule five applied in spades. Funny enough the only other Black to make me whoop and giggle is also the Vulcano. @GlasgowCyclops, You're a man of exquisite tastes! Pila, red 17 and 18, just lovely runs. +1 to all the Alta Badia runs mentioned above. Does Zuppert down to Zug count? It was ace last Sunday with knee to thigh deep powder with few tracks in it. Combe Saulire in Courchevel - but only if you can find that rare moment when the snow is perfect and the run is empty, then this is close to heaven. Black. Top to bottom Andalo, or Dave Murray whistler or.Luc Alphonse, Serre Che. Green - I think the one in Courchevel where we did GS carving tuition was a green? And it's the only one I'd have skied in the last decade, so it has to be that by definition. Red - Was going to say that it used to be the Melezes run in Les Gets (a long time ago, for the "stadium finish" bit), but opensnowmap claims that's blue. Too many reds to decide from. La Crusc/Santa Croce run claims to be reddy-blue or bluey-red (but I'd have called it blue), and that one is definitely up there as part of the whole day experience. Black - Prefer the Gran Risa GS in Alta Badia to the Sasslong DH in Val Gardena, but Lauberhorn definitely wins on variety (and it was the first WC piste I skied, and it was the first black that I skied that's still graded black, and it was fun getting the full start hut treatment too ). Melezes is a good shout. It used to be a red because of a little stretch near the top which no longer forms part of the run. Best green - it's a 10 at kicking horse. Hands down. Far too many to recall. Got my favourite pistes from various resorts but can’t remember the names of them!!! Ski Route 1 @ Schlick 2000, Austria.. not sure if we're allowed ski routes, but couldn't get enough of this when I was there, bumps/steep/trees, what's not to like? A no-brainer: piste 68 (aka the Viehhofen Abfahrt) at Saalbach. Usually deserted, a perfect gradient for practising carved turns. beautiful scenery, and probably the best (out of 60+) mountain restaurants half-way down. Two favourites - both in Banff/Lake Louise. Boomerang (blue) at Lake Louise. Starts a short side step up from ‘the drag lift from hell’ but so so worth it. A real ‘out there’, remote feel you don’t often get in North America, open, sweeping, superb snow and stunning scenery. Perfectly graded as a tough blue, just enough to keep you on your toes without being too hard. Then join the green for a lovely easy cruise to Temple Lodge. 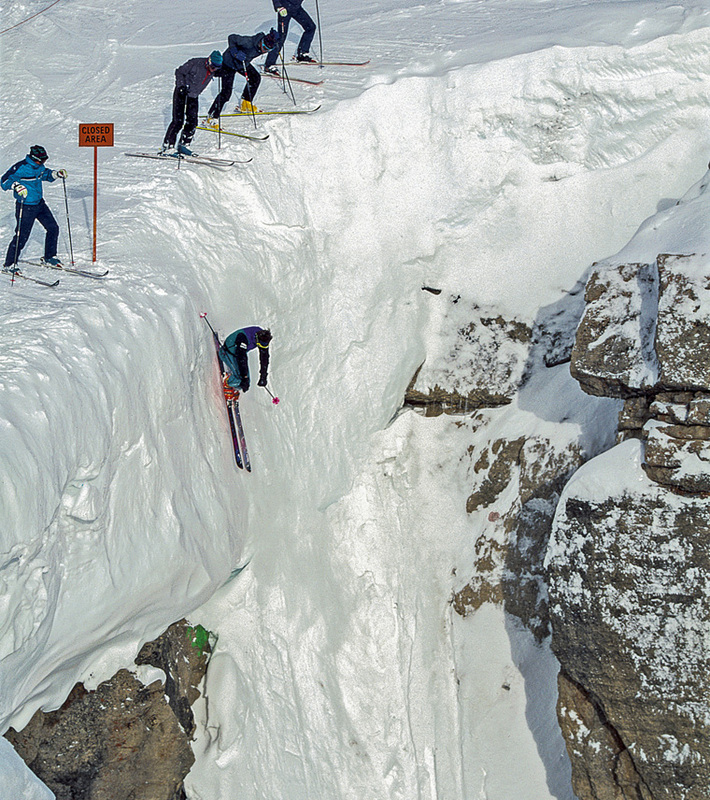 Isn't it "Corbet's Couloir" in Jackson Hole??? Given I ski most of the time in Les Contamines / EMB these days while accepting that the pistes are not as good as the above I'd mention highlights as Les Contamines Croix (Blue) into Belleville (Red) all the way down to Hauteluce, ideally non-stop. Also Croche (Black) into Grevettaz (Black). In Megeve/St Gervais I really like all the runs from Mont Arbois to Combloux, perhaps the red most of all - Moriss Millox into Grand Bois (varied, tree-lined then through meadows, nice). @HoneyBunny, Jerusalem was a red, but now it’s a blue, after they put an alternative gentler way down in at the top. The steep at the top is still there and is a red section, but they’ve renamed it Cheferie. Oh that's interesting, the top bit was the fun bit! I've not skied it for years. For a "proper" red I'll have Arcelle in Val d'Isere as a back up, I love that run. Black: one of my favourite memories is the Dous des lanches above La Tania on a perfect bluebird morning when we lapped it several times. Black: Saches in Tignes, did that several times last Easter and enjoyed watching the youngest (age 6!) doing it better than me - although not pulling him on the flat middle bit. Blue: Cascades - it was a fun afternoon out with friends 10 years ago now! forest and through the trees to Brandegg. Red: As has been mentioned by others, #7 Cervinia, europe's highest cable car & one of the world's longest ski runs. Also the Hidden Valley, isolation, frozen waterfalls & a horse drawn drag out at the bottom. signs explaining their names etc. Iconic. #3 La Thuile... steep, icy & dark. Blue: Top of the Roche De Mio, La Plagne to the tunnel, only for thre fact I did it in knee deep powder and had so much fun. Red: Piste 70 Resterhohe, Kitzbuhel a great top to bottom non stop blast. Black: Piste 55 Hochsaukaiser Kitzbuhel, as above. @marksovereign, I add red 23.to Grindlewald in addition to Ober National(black) in Zermatt. Exactly as you describe it on sadly the only time I have yet skied it. It was exceptional. I did love that - a real adventure and unrivalled scenery. We watched people ice climbing when we did it! Blue - Kitzbuheler Horn when its sheet ice! And what @Gazzza, says in the 4th post. Derailleur - Winter Park. I'm not sure what this is like without fresh snow, but you want to hit it hard and fast when there's been 20+cm of fresh, and what are probably decent bumps turn into a playground you can just rip down. Thinking about it, there are other runs like that which I also really liked in similar conditions - the Solaise bumps (Val d'Isere before they groomed it), La Sache (Tignes), Freefall (Sunshine), Trifji (Zermatt, when it was a piste). Dame Blanche (Val T)... I'm going to be rubbish at this, because to me the important thing isn't the run, it's the snow. So I tried to think of runs I've done with garbage snow which were still good. The run from Idalp back to the village in Ischgl. The snow was warm when I was there, but it's a long run through some massive valley sections and a real top-to-bottom blast. The glacier runs in Sölden. The runs through the trees to the village in Zermatt - busy, sloppy, easy, and full of tourists, but close to some excellent eating places. I’d also vote for two reds. Fontaine Froide in La Rosiere which I’ve enjoyed many times in a variety of conditions. Then Combe Vallon in Meribel - looking forward to skiing it in about three weeks for the first time in 10 years. to me the important thing isn't the run, it's the snow. Agreed - I'm just the same. On our recent road trip, an instructor asked us which area we preferred. Couldn't decide as the conditions had been good for different reasons at all of them. how do you pick just one ? Then pick one run from that ? I think all my favourites have been covered on this thread before, but its great to read that others appreciate them as much as me. That’s Zürser Tali. It too has been sanitised a bit over the years. The take-off point on the headwall has been shifted progressively towards the skier’s right, meaning it is no longer as steep as it once was. Side note: the high traverse that many use to avoid the high speed tuck for exiting Zürser Tali, and hence returning to Zürs, was covered by an avalanche during the first week in March. But this year's new entry is Red 2 at Buchensteinwand. The top section is an unpisted ski route, which can be avoided. It was the last run of the day and I was literally the only person on it. A wide, steep, 3 or 4km run straight down the mountain. What a blast!